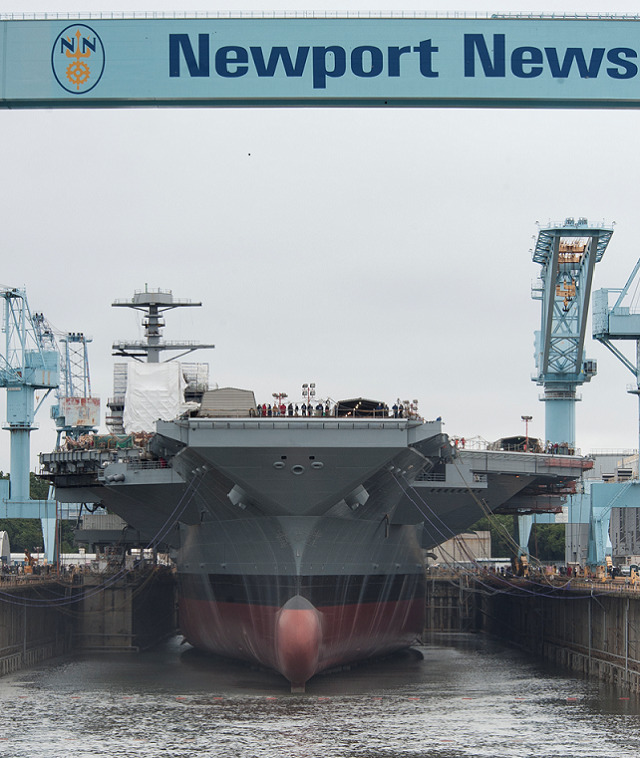 Huntington Ingalls Industries (HII) announced today that its Newport News Shipbuilding (NNS) division began flooding the dry dock where the nuclear-powered aircraft carrier Gerald R. Ford (CVN 78) has been under construction since November 2009. With the push of a dozen buttons, ship’s sponsor Susan Ford Bales initiated the flow of more than 100 million gallons of water into the dry dock. 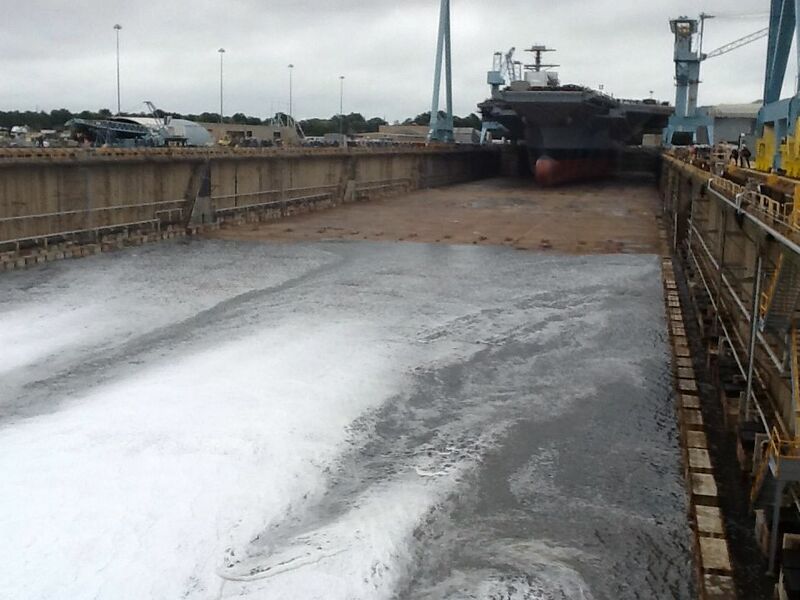 The flooding of the dry dock takes place in phases during which various tests are conducted. Initially, the dock is flooded about 4 feet high to its keel blocks, wood-capped concrete pads on which the ship has been supported during construction. Once the dock is fully flooded and initial afloat testing is complete, water will be partially pumped out and the ship returned to her keel blocks in anticipation of Ford’s christening on Nov. 9. The ship will float again about a week later when it is moved to a pier for outfitting. Ford is scheduled for delivery to the U.S. Navy in 2016. 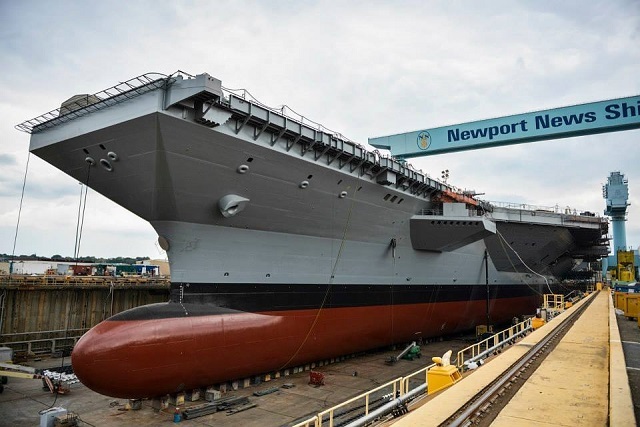 Gerald R. Ford represents the next-generation class of aircraft carriers. The first-in-class ship features a new nuclear power plant, a redesigned island, electromagnetic catapults, improved weapons movement, an enhanced flight deck capable of increased aircraft sortie rates, and growth margin for future technologies and reduced manning.